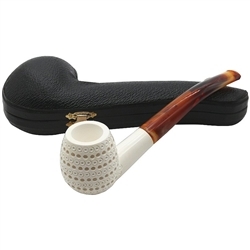 Hand Carved 3D Round Lattice Meerschaum Pipe - Stylish billiard bowl pipe has a 3D effect accomplished by the carver taking the extra time to carve under each section of round lattice. This pipe has a thick bowl and the coloring inside the round lattice will look striking. The shank is carved smooth connecting to an amber colored bent stem.